Effective Altruism Community Building Grants is a project run by the Centre for Effective Altruism (CEA), providing grants of between $5,000 and $100,000 to individuals and groups doing local effective altruism community building for the academic year of 2018-19. We believe this could be a high impact project for the EA community in the long term, because it is a way in which we can increase the time and effort that goes into EA community building. This post is an update on how the project is going so far, including an overview of the application process, the grants we’ve made, our evaluation criteria, and plans for the future. Effective altruism groups are an integral part of the EA community and have played a central role in helping the community achieve many of its aims. They help direct funds to effective causes, influence people’s career trajectories (including placing people in high-impact organisations), contribute to the intellectual progress of the community, and help shape EA culture. The goal of Community Building Grants is to scale the impact of high-potential effective altruism groups by increasing their organisational capacity. We expect this to have a number of beneficial effects, but we see a key benefit being the empowerment of group members to work on the world’s most important problems. We also expect Community Building Grants to enable group organisers to better coordinate and support each other, to pursue valuable projects outside the scope of EA community building, and to more more effectively disseminate a high fidelity understanding of effective altruism. This is a new project for CEA and can be seen as a way of testing the hypothesised route to impact of providing significant funding to effective altruism groups. If we judge EA Community Grants to have been successful, we intend to expand the project and the amount of funding allocated to it. Because the project is new, we’re also in the process of resolving any kinks and expect to continue to tweak the process as we learn more about how to execute it effectively. To read more about EA Community Building Grants and the core rationale for the project, see this launch post. The EA Community Grants were advertised via the EA Forum in March, in the grants announcement post, with a link to the application form. Applicants could apply as individuals or with a joint application. Applicants who passed the first interview stage were then interviewed by Harri Besceli, with Kerry Vaughan monitoring the interview process during April and May. After the interviews, final decisions were made by June. Applicants also nominated referees who were asked to provide a reference in borderline cases. Applicants were scored on three criteria, and the scores were combined (using equal weighting) to create an overall rating of the application. This acted as a key input to the final decisions but did not solely determine the final decisions. 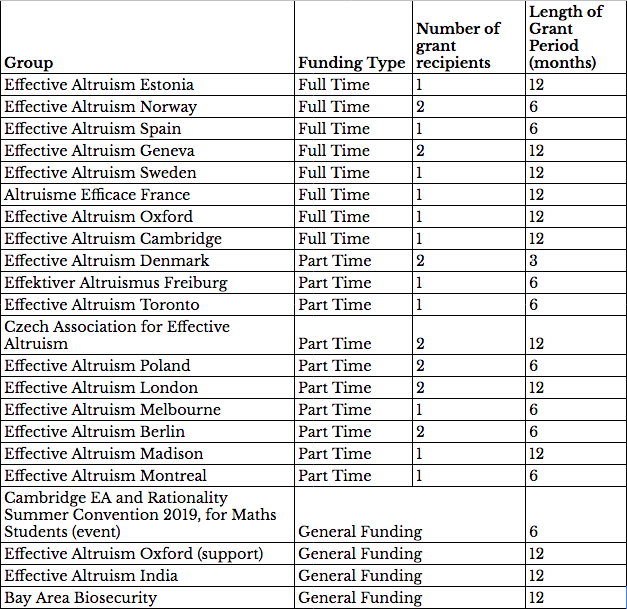 Since launching in March, 22 grant offers were made, for a total of $623,000, with the significant majority of grants offers being to enable group organisers to work full- or part-time on organising their effective altruism group. Of the 22 offers made, 18 are to fund individuals directly working on their effective altruism group, and 4 were for general expenses for groups or specific projects. The table below lists the grants made, the number of people who will be working part- or full-time as a result of the grants, and the length of the grant period. The majority of the grant periods started at the beginning of this month. A small number of applications to EA Community Grants were referred to EA Grants for evaluation, and aren’t included below. We ultimately granted significantly more funding than we expected to. This was largely due to the quality of applicants exceeding our expectations, but also because we concluded that the potential for harmful indirect effects was smaller than we previously thought. Recipients of EA community grants will largely work independently from and autonomously to CEA. The main support offered is regular calls with CEA staff, a private Slack channel, and a retreat which took place in September (hosted and co-organised by the Czech Association for Effective Altruism). The structure and extent of support for grantees is something that we intend to experiment with significantly over the duration of the grant period. Give groups clear guidance on what would cause us to evaluate their activities favourably. Make it easy for the EA community and potential funders to understand and evaluate the success of EA Community Grants. Provide sufficient evidence of the value produced to enable CEA to make well-informed decisions on whether to renew funding for given groups, and whether to scale the EA Community Grants process. Avoid incentivising groups to optimise for our metrics rather than for what is actually highest-impact. Minimise the time cost to CEA and to groups in evaluating their results. On the basis of these criteria, we’ve chosen to evaluate the success of grants primarily by assessing outcomes pertaining to influencing the career trajectories of their members, but also by taking into account how groups are good representatives of the EA community and by evaluating other valuable outcomes on a case-by-case basis. The primary metric used to assess grants at the end of the first year is the number of group members who apply for internships or graduate programs in priority areas and reach at least the interview stage. For subsequent years, the primary metric used to assess the grants is the number of group members who go on to work in priority areas. We have chosen to prioritise career-related outcomes because we believe that this will track a key source of value of the community grants and because we feel like we have a reasonable understanding of the value of these kinds of outcomes. Though career-related outcomes will be a useful proxy for success, it’s worth emphasising that we don’t expect them to capture all of the value that the groups produce. However, we feel it is important to have some concrete metrics for our projects, especially ones that require a lot of people’s time and money. We used the 80,000 Hours list of priority paths as the basis for our list of accredited roles, but expanded it to be somewhat broader. The areas and roles that we intend to accredit are still being decided upon, and we expect the number of accredited roles and areas to increase in the future. We’ve chosen a relatively restricted set of criteria for the time being, as we think the costs to later restricting the criteria will be significantly higher than the costs of expanding them. A general expectation of all grantees and a necessary condition for receiving further funding is that they abide by CEA’s Guiding Principles of Effective Altruism, and are good representatives of the EA community. By this, we mean that we expect the indirect effects of grantees to the community to be positive, both by affecting the public perception of effective altruism, and the cultural norms of the effective altruism community. Beyond career-related outcomes, we will encourage grantees to submit other outcomes that they’ve produced, which we can evaluate on a case-by-case basis. Such outcomes could include career-related outcomes not previously specified, or non-career related outcomes, such as supporting other EA Groups, influencing donations, etc. This is in part intended to minimise the potential of creating adverse incentives, and to help us better understand the value created by grantees for future evaluation rounds. Helping out other EA groups, with information and shared best practices. Distorting thinking of the grantees by giving them incentive to believe this is just the correct thing to do and not question it too closely. We hope to avoid these negative effects by providing after-the-fact assignment of credit for outcomes outside the scope of the primary success criteria, and by emphasising the criterion of ‘being a good representative of EA’. We recognise that these measures may be imperfect, and may seek to make improvements to future evaluation criteria based on our mid-term review of current grantees’ reported outcomes. CEA will run another, smaller, EA Community Grants round in January 2019, and in the summer of 2019, when the success of the first community grants will also be evaluated. Prior to the summer 2019 funding round, we’ll evaluate the grants provided so far. If we judge specific EA Community Grants to be successful, we’ll renew the funding provided to those groups in the funding round, and for groups we judge to have been particularly successful, we’ll provide grants for time periods longer than a year. Additionally, if we judge the process as a whole to have been successful, we’ll expand the number of groups we fund. 5 people working on supporting and coordinating EA Community Grantees, providing a combination of retreats, conferences, training, mentorship, online infrastructure etc. If you’d like to support EA Community Building Grants, you can do so here. Additional funding would likely increase our willingness to fund more groups in the January funding round, although this depends on the applicant pool. If you have any questions relating to EA Community Grants, please contact groups@effectivealtruism.org.